Know All About December 2012 !! Will It Be The End Of Times? Just what does December 21, 2012 mean to us? Is the end date of the Mayan calendar really the start of an approaching apocalypse, or even a spiritual rebirth? How much of what we're hearing is science and how much is superstition? This blog provides a balanced look at the 2012 phenomenon with leading researchers, writers and scientists in the field explaining exactly what this date means, why it's important, and what we should expect. What we find as curious, is that while interest in Planet X / Nibiru has risen dramatically. Nibiru (or Planet X) myths have been around for years, and continue to prevail. I have searched about this subject but I cannot add much more to the wealth of accurate information already out there. Instead, I’ll cover a few of the main points. Nibiru does not exist, and a non-existent object cannot hit the Earth in 2012. It is perhaps believable because it has had so much time to sink in, so much media attention, and so much authority (albeit it false) plumping it up. For a start, no Sumerian texts even suggest the existence of such a planet (ancient texts scholar Michael Heiser has covered this on his website). Also, professional astronomers have no data to suggest the existence of such a planet. The Planet X Arguments (Bad Astronomy website), author Phil Plait points out that the planet was not detected by NASA in the early eighties, despite popular belief that it was (and that it’s still being secretly monitored). Some objects were found in the early eighties, but the possibility of one being a planet was quickly refuted. However, space agencies aside, there is no cosmic umbrella that stops amateur astronomers from investigating. In his article The Myth of Nibiru and the End of the World in 2012 (Committee for Skeptical Inquiry Website), author and astronomer David Morrison describes astronomers (both professional and amateur) as “a free-spirited group who couldn’t keep a secret if they wanted to”. Is it worth preparing for, since we can’t really know? On the face of it, this stance sounds sensible. However, there is much we “can’t really know” that we don’t prepare for. We can’t know with a 100% certainty that a comet won’t hit us tomorrow, or the next day, or the day after. The difference between Nibiru and my comets is that my comets haven’t been dressed in the same hype, sensationalism and outright lies. Just look at similar doomsday events that turned out to be untrue. Nothing bad happened when the planets aligned in 2000, and no black hole gobbled the Earth when the Large Hadron Collider was switched on in 2008. Perhaps more importantly, the very same Nibiru did not flip the Earth over in 2003 (my source here is that I think I would have noticed). I’ve only been able to look at the tip of the iceberg here, and fortunately there are some sites that go into depth. An excellent recent article on this topic is The Myth of Nibiru and the End of the World in 2012, published on the Committee for Skeptical Inquiry website. A great site that covers the myth in detail is Planet X and the Pole Shift. Solar Storm in 2012 Could Be The Reason..!!! We could be in for a huge firework display in 2012. The Sun will be approaching the peak of its 11-year cycle, called "solar maximum", so we can expect a lot of solar activity. Scientists from the National Center for Atmospheric Research (NCAR) predict the next upcoming storm cycle to begin in late 2007 or early 2008, and reach its peak in 2012. Some predictions put the solar maximum of Solar Cycle 24 even more energetic than the last solar maximum in 2002-2003 (remember all those record breaking X-class flares?). Solar physicists are already getting excited about this next cycle and new prediction methods are being put to good use. But should we be worried? According to one of the many Doomsday scenarios we have been presented with in the run-up to the Mayan Prophecy-fuelled "end of the world" in the year 2012, this scenario is actually based on some science. What's more, there may be some correlation between the 11-year solar cycle and the time cycles seen in the Mayan calendar, perhaps this ancient civilization understood how the Sun's magnetism undergoes polarity changes every decade or so? Plus, religious texts (such as the Bible) say that we are due for a day of judgement, involving a lot of fire and brimstone. So it looks like we are going to get roasted alive by our closest star on December 21st, 2012! The Earth has evolved in a highly radioactive environment. The Sun constantly fires high-energy particles from its magnetically dominated surface as the solar wind. During solar maximum (when the Sun is at its most active), the Earth may be unlucky enough to be staring down the barrel of an explosion with the energy of 100 billion Hiroshima-sized atomic bombs. This explosion is known as a solar flare and the effects of which can cause problems here on Earth. Before we look at the Earth-side effects, let's have a look at the Sun and briefly understand why it gets so angry every 11 years or so. First and foremost, the Sun has a natural cycle with a period of approximately 11 years. During the lifetime of each cycle, the magnetic field lines of the Sun are dragged around the solar body by differential rotation at the solar equator. This means that the equator is spinning faster than the magnetic poles. As this continues, solar plasma drags the magnetic field lines around the Sun, causing stress and a build up of energy (an illustration of this is pictured). As magnetic energy increases, kinks in the magnetic flux form, forcing them to the surface. These kinks are known as coronal loops which become more numerous during periods of high solar activity. This is where the sunspots come in. As coronal loops continue to pop up over the surface, sunspots appear too, often located at the loop footpoints. Coronal loops have the effect of pushing the hotter surface layers of the Sun (the photosphere and chromosphere) aside, exposing the cooler convection zone (the reasons why the solar surface and atmosphere is hotter than the solar interior is down to the coronal heating phenomenon). As magnetic energy builds up, we can expect more and more magnetic flux to be forced together. This is when a phenomenon known as magnetic reconnection occurs. Reconnection is the trigger for solar flares of various sizes. As previously reported, solar flares from "nanoflares" to "X-class flares" are very energetic events. Granted, the largest flares my generate enough energy for 100 billion atomic explosions, but don't let this huge figure concern you. For a start, this flare occurs in the low corona, right near the solar surface. That's nearly 100 million miles away (1AU). The Earth is nowhere close to the blast. As the solar magnetic field lines release a huge amount of energy, solar plasma is accelerated and confined within the magnetic environment (solar plasma is superheated particles like protons, electrons and some light elements such as helium nuclei). As the plasma particles interact, X-rays may be generated if the conditions are right and bremsstrahlung is possible. (Bremsstrahlung occurs when charged particles interact, resulting in X-ray emission.) This may create an X-ray flare. The biggest problem with an X-ray flare is that we get little warning when it is going to happen as X-rays travel at the speed of light (one of the record breaking 2003 solar flares is pictured left). X-rays from an X-class flare will reach the Earth in around eight minutes. As X-rays hit our atmosphere, they are absorbed in the outermost layer called the ionosphere. As you can guess from the name, this is a highly charged, reactive environment, full of ions (atomic nuclei, and free electrons). During powerful solar events such as flares, rates of ionization between X-rays and atmospheric gases increase in the D and E region layers of the ionosphere. There is a sudden surge in electron production in these layers. These electrons can cause interference to the passage of radio waves through the atmosphere, absorbing short wave radio signals (in the high frequency range), possibly blocking global communications. These events are known as "Sudden Ionospheric Disturbances" (or SIDs) and they become commonplace during periods of high solar activity. Interestingly, the increase in electron density during a SID boosts the propagation of Very Low Frequency (VLF) radio, a phenomenon scientists use to measure the intensity of X-rays coming from the Sun. X-ray solar flare emissions are only part of the story. If the conditions are right, a coronal mass ejection (CME) might be produced at the site of the flare (although either phenomenon can occur independently). CMEs are slower than the propagation of X-rays, but their global effects here on Earth can be more problematic. They may not travel at the speed of light, but they still travel fast; they can travel at a rate of 2 million miles per hour (3.2 million km/hr), meaning they may reach us in a matter of hours. This is where much effort is being put into space weather prediction. We have a handful of spacecraft sitting between the Earth and the Sun at the Earth-Sun Lagrangian (L1) point with sensors on board to measure the energy and intensity of the solar wind. Should a CME pass through their location, energetic particles and the interplanetary magnetic field (IMF) can be measured directly. One mission called the Advanced Composition Explorer (ACE) sits in the L1 point and provides scientists with up to an hour notice on the approach of a CME. ACE teams up with the Solar and Heliospheric Observatory (SOHO) and the Solar TErrestrial RElations Observatory (STEREO), so CMEs can be tracked from the lower corona into interplanetary space, through the L1 point toward Earth. These solar missions are actively working together to provide space agencies with advanced notice of an Earth-directed CME. So what if a CME reaches Earth? For a start, much depends on the magnetic configuration of the IMF (from the Sun) and the geomagnetic field of the Earth (the magnetosphere). Generally speaking, if both magnetic fields are aligned with polarities pointing in the same direction, it is highly probable that the CME will be repelled by the magnetosphere. In this case, the CME will slide past the Earth, causing some pressure and distortion on the magnetosphere, but otherwise passing without a problem. However, if the magnetic field lines are in an anti-parallel configuration (i.e. magnetic polarities in opposite directions), magnetic reconnection may occur at the leading edge of the magnetosphere. In this event, the IMF and magnetosphere will merge, connecting the Earth's magnetic field with the Sun's. This sets the scene for one of the most awe inspiring events in nature: the aurora. As the CME magnetic field connects with the Earth's, high energy particles are injected into the magnetosphere. Due to solar wind pressure, the Sun's magnetic field lines will fold around the Earth, sweeping behind our planet. The particles injected in the "dayside" will be funnelled into the polar regions of the Earth where they interact with our atmosphere, generating light as aurorae. During this time, the Van Allen belt will also become "super-charged", creating a region around the Earth that could cause problems to unprotected astronauts and any unshielded satellites. For more on the damage that can be caused to astronauts and spacecraft, check out "Radiation Sickness, Cellular Damage and Increased Cancer Risk for Long-term Missions to Mars" and "New Transistor Could Side-Step Space Radiation Problem." As if the radiation from the Van Allen belt wasn't enough, satellites could succumb to the threat of an expanding atmosphere. As you'd expect, as if the Sun hits the Earth with X-rays and CMEs, there will be inevitable heating and global expansion of the atmosphere, possibly encroaching into satellite orbital altitudes. If left unchecked, an aerobraking effect on satellites could cause them to slow and drop in altitude. Aerobraking has been used extensively as a space flight tool to slow spacecraft down when being inserted into orbit around another planet, but this will have an adverse effect on satellites orbiting Earth as any slowing of velocity could cause it to re-enter the atmosphere. Although satellites are on the front line, if there is a powerful surge in energetic particles entering the atmosphere, we may feel the adverse effects down here on Earth too. Due to the X-ray generation of electrons in the ionosphere, some forms of communication may become patchy (or be removed all together), but this isn't all that can happen. Particularly in high-latitude regions, a vast electric current, known as an "electrojet", may form through the ionosphere by these incoming particles. With an electric current comes a magnetic field. Depending on the intensity of the solar storm, currents may be induced down here on the ground, possibly overloading national power grids. On March 13th 1989, six million people lost power in the Quebec region of Canada after a huge increase in solar activity caused a surge from ground-induced currents. Quebec was paralysed for nine hours whilst engineers worked on a solution to the problem. Can Our Sun Produce a Killer Flare? The short answer to this is "no". The longer answer is a little more involved. Whilst a solar flare from out Sun, aimed directly at us, could cause secondary problems such as satellite damage and injury to unprotected astronauts and blackouts, the flare itself is not powerful enough to destroy Earth, certainly not in 2012. I dare say, in the far future when the Sun begins to run out of fuel and swell into a red giant, it might be a bad era for life on Earth, but we have a few billion years to wait for that to happen. There could even be the possibility of several X-class flares being launched and by pure bad luck we may get hit by a series of CMEs and X-ray bursts, but none will be powerful to overcome our magnetosphere, ionosphere and thick atmosphere below. "Killer" solar flares have been observed on other stars. In 2006, NASA's Swift observatory saw the largest stellar flare ever observed 135 light-years away. Estimated to have unleashed an energy of 50 million trillion atomic bombs, the II Pegasi flare will have wiped out most life on Earth if our Sun fired X-rays from a flare of that energy at us. However, our Sun is not II Pegasi. II Pegasi is a violent red giant star with a binary partner in a very close orbit. It is believed the gravitational interaction with its binary partner and the fact II Pegasi is a red giant is the root cause behind this energetic flare event. Doomsayers point to the Sun as a possible Earth-killer source, but the fact remains that our Sun is a very stable star. It does not have a binary partner (like II Pegasi), it has a predictable cycle (of approximately 11 years) and there is no evidence that our Sun contributed to any mass extinction event in the past via a huge Earth-directed flare. Very large solar flares have been observed (such as the 1859 Carrington white light flare)… but we are still here. In an added twist, solar physicists are surprised by the lack of solar activity at the start of this 24th solar cycle, leading to some scientists to speculate we might be on the verge of another Maunder minimum and "Little Ice Age". This is in stark contrast to NASA solar physicist's 2006 prediction that this cycle will be a "doozy". This leads me to conclude that we still have a long way to go when predicting solar flare events. Although space weather prediction is improving, it will be a few years yet until we can read the Sun accurately enough to say with any certainty just how active a solar cycle is going to be. So, regardless of prophecy, prediction or myth, there is no physical way to say that the Earth will be hit by any flare, let alone a big one in 2012. Even if a big flare did hit us, it will not be an extinction event. Yes, satellites may be damaged, causing secondary problems such as a GPS loss (which might disrupt air traffic control for example) or national power grids may be overwhelmed by auroral electrojets, but nothing more extreme than that. But hold on, to sidestep this issue, doomsayers now tell us that a large solar flare will hit us just as the Earth's geomagnetic field weakens and reverses, leaving us unprotected from the ravages of a CME… The reasons why this is not going to happen in 2012 is worthy of its own article. Some years ago amidst my explorations of occult subjects, I discovered there was a cult of interest surrounding the specific time 11:11. This had it seemed come about due to peoples peculiar experiences with this time, or with the number 1111. Generally speaking this was explained in the context of synchronicity, meaningful coincidence. The 11:11 phenomena’s participants would find that most every day they would happen to look at a clock at exactly 11:11 or perhaps 23:11. In time people tried to explain why this was happening, the most popular explanation was that a group of higher being, or angels, were using it to bring themselves into human awareness. This explanation became very popular and has spawned numerous groups and indeed books centred around it. This interpretation of 11:11 phenomena is however not of great interest to most 2012 researchers. The number 11 in both singular and duplicate form has great importance for 2012 related astrology, prophecy, numerology and history. Lets just start by making everyone aware that if we take the Mayan symbol for 11 and then duplicate it, flip its duplicate, shift them both ninety degrees, we have the image of 11:11. During the last couple of months it came to the attention of fringe arena Mayan calendar scholars, that the winter solstice marking the end of the Mayan Long Count cycle, occurs exactly at 11:11 universal time. This has been a huge revelation, one that has opened a Pandora’s box of linked data. New 2012 perspectives, and indeed increased synchronicity, have followed suit en masse. Of course 11 has its own numerological meanings. One numerological interpretation is that it marks the beginning of new cycles and increased spiritual and compassionate factors. It is considered as one of the master numbers, those that are not reduced by the addition of the constituent numbers. There is a great deal of information available on this aspect of the topic, more than I can cover here. This number and specifically the time 11:11 appearing linked to the December 2012 event has stunned many of those experiencing the temporal synchronicity events. Indeed it has shocked some of the supernatural and occult subject researchers who had long begun to ignore the phenomenon, such as myself for example. I must admit that I have a particular bias in that I have myself experienced 11:11 temporal synchronicity events myself. Additionally I have 1:1 in my birth-date, which on an intuitive level always felt some how important to my life quest. I have in fact returned to this particular subject of mysterious 11’s by the synchronicity of separate personal contacts having sent me 11:11 related data within hours of one another. Upon logging into a particular site in which to post a follow up to the data I found myself on post number 1111 of the web thread. The game was afoot once again, as Sherlock Holmes might of said. In my study of the 21-12-2012 subject matter there is a specific topic that absorbs much of my thought. The contemplation of Solar dynamics and Solar behaviour. I am by no means a Heliophysicist, or a even a particle physicist for that matter. As such I rarely brave explaining the role magnetospheric dynamics or other in depth Solar process have to play in respect to the subject of 21-12-2012. Even respected ‘experts’ on the science behind the workings of our nearest star admit that they do not have complete models. New understandings are always being reached in this area of astrophysics. There is no doubt however that the Sun’s often erratic behaviour does have massive effects on our Earth’s biosphere. We sometimes forget that we do not merely orbit the sun but rather reside deep within its magnetosphere, the invisible part of the sun that extends out as a spherical bubble enclosing the inner planets. Many experts have contended that changes in atmospheric ion count, for example, effect human and animal behaviour as well as our bio-clocks. Even influencing biological, physiological and behavioural patterns of all living things. Certainly we know that some frequencies of radiation from the sun can effect cell division, or indeed even brain functions. Excess or lack of certain frequencies, and types of solar radiation have been observed to have radical effects on human beings under laboratory conditions. The reason why the Sun becomes important in the 11:11 subject is not simply that it is of course central to a solstice point in our calendar. It also happens to be that the sun’s magnetic field operates a cycle of polarity reversals averaging 11.11 years in length. The next peak of this cycle happens to be in the year 2012 and has been predicted by astrophysicists to be a very active maximum, possibly the most active since the end of the last ice-age. Nikola Tesla, the unsung hero of science whom gave us such wonders as alternating current (imagine not having that! ), was himself rather interested in the Sun. Although a hard scientist, he was also rather superstitious about numbers, and held the perhaps strange belief that the Sun and the Earth were dynamic living organisms. A belief also held by many indigenous peoples of the America’s and indeed world-wide. I mention this because on some level I am left wondering if the Sun is either consciously or by unknown natural mechanisms communicating with the life forms that inhabit its sphere of influence? Is the Sun, our temporal governor, speaking to us through the very devices that display its movement through the divisions of the day. Could this really be like the elephant in the living room that nobody wants to see, the sun having an 11.11 year cycle, the winter solstice of 2012 falling at 11:11 and people all over the world finding themselves bombarded with 11’s just as science is predicting some kind of majestic solar event at the peak of this current cycle? Interestingly 11’s have played important roles in recent world history. The 11th minute of the 11th hour of the 11th day is the official moment of remembrance for the lives lost during, and cessation of, the terrible fighting in Europe during WWI. Two minutes of silence are observed, a pair of 1's yet again. More recently we have the initiation of a war on September 11- 01, which may yet be remembered as the start of WWIII. It also transpires that 111 in numerology is a ‘power number’ related to fresh modes of thinking applied to new cycles in life‘s play. Its also interesting to note that the very numbers of the solstice date 21-12-2012 can be added together to give us the number 11 once again. Almost like a fail safe, just in case we were to dumb to of noticed all the other 11 related patterns! Before leaving this subject completely it is worth a tour through some other related data just for fun. It is not my place to reach any absolute conclusions, and as such any relevant information is possibly worth sharing whilst on topic. Also I do ask that everyone bears in mind that the Gregorian and Mayan systems are very different, and that in the Mayan system there is no 11:11 21-12-2012 as such. Rather there is 13.0.0.0.0 as an end date. One fun mathematical oddity is the fact that 1111 multiplied by 1111 gives us 1234321. This forms two sides of a structure not Mayan stepped pyramid in numeric form. In terms of the much vaunted ‘New Age’ and the coming of the era of Aquarius, its notable that the water bearer is the 11th sign of the zodiac cycle. Interestingly the moving to the point 1111 days before the 2012 solstice gives us the date 6-12-09. The fact that 6, 9, & 12 are sequential multiples of perhaps the most highly regarded spiritual number 3 is a notable fact. For my part 3, 33, 333 & 3:33 have been the numbers that follow me through my life more than any others in relation to synchronicity. The 11 link returns when we divide 33 by 3 which of course give us 11 once again. Also don't forget that the date 9-11 can also be seen in numerology as 333-11. Perhaps the most powerful lesson inherent in the number 11, is that there is one, and next to it there is one. I am another yourself, and you are another myself. Each is one. All are one. There is only one. If only all mankind could find in that, a simple message of truth. Michel de Nostredame ( Nostradamus in Latin ), was a French apothecary and reputed seer seer who published collections of prophecies that have since become famous worldwide. He was born December 14th or 21st (various sources) in December of 1503, and died July 2nd 1566 - at age 62. He is well known for his book Les Propheties ( The Prophecies ), the first edition of which appeared some time in 1555. Since the publication of this book, which has almost never gone out of print since his death, Nostradamus has attracted a following that credits him with predicting many major world events and historcal turning points. The prophecies have in some cases been absorbed to the results of applying the alleged Bible code , as well as to other purported prophetic works. Most academic sources maintain that the associations made between world events and Nostradamus's quatrains are largely the result of misinterpretations or mistranslations (sometimes purposely) or else are so tenuous as to render them useless as evidence of any genuine predictive power. What does all that mean? He was VAGUE, and extremely obscure - Often using symbolism (of his time) and also writing in 3 different languages. Maybe you never heard of the Great London Fire of 1666, but that doesn't mean it wasn't a big deal back then. The fire itself; pretty much wrecked most of medieval London within the old Roman walls. Only six deaths were recorded ( "the six" in the second line), though poor people and commoners' deaths may not have been recorded..The fire, which supposedly started in a baker's shop, scohed the city for three days straight. Obviously if people had known that's what the translation was, they could have added Nostradamus to their fire safety manual and avoided the blaze. The Great Fire of London consumed nearly two-thirds of London in 1666. This is one of the rare prophecies where Nostradamus refers to a specific year. It consumed 13,200 houses, 87 parish churches, St. Paul's Cathedral, and most of the buildings of the City authorities. It is estimated that it destroyed the homes of 70,000 of the City's ca. 80,000 inhabitants. Nostradamus knew, of course, of the ancient Greek and Roman Empires; and the Holy Roman Empire had been in existence since the year 962. But his use of the words "Empire" and "Emperor", rather than "King" and "Kingdom", is held to be significant. The Napoléonic campaigns and wars were fought, won and lost at the cost of millions of French lives - as well as those of Allied and Client states. Did Nostradamus predict world war 2 and Hitler? In an illustration by Nostradamus himself, from the Lost Book Of Nostradamus, depicts a burning tower. The above quatrain was immediately thought of after the 9 11 attacks. New York City (great new city) is roughly located near 45 degrees. The sky did burn and fire approached the city. Proof of the Normans may refer to France's desire for proof that Iraq had something to do with 9/11or wmd's to justify an invasion using the towers as a false pretext..
"Earthshaking fire from the center of the Earth Will cause tremors around the New City. Two great rocks will war for a long time, Then Arethusa will redden a new river." Supposedly two great rocks could mean two great towers. But why would he say "war for a long time" - as almost to sound like... against each other. If September 11th hadn't happened, doesn't it souns like an earthquake or volcano erupting? When Nostradamus wrote those infamous lines, skyscrapers like the WTC Twin Towers, and massive airplanes like the ones that crashed into them - even cities as massive as New York were probably not imaginable. What about the future, 2012? A major, underlying theme is an impending invasion of Europe by Muslim forces from further east and south headed by the expected (3rd) Antichrist. There has been talk of the assassination of the pope or the destruction of Rome by a nuclear bomb. The doomsday crown always insist that Nostradamus said the world was going to end and that he NEVER GOT ANYTHING WRONG. Now days it's all about 2012. Specifically, December 21st 2012. Nostradamus wrote that his prophecies only went as far as the year 3797. Think what you want, and read below - I will list some misconceptions about 2012. I came across this 4 part video series of the Mayan Inca Aztec Egyptian Prophecy of 2012. It seems that no matter if the prediction is 5 years old, 500 years old, or 5000 years old, they all point to the same date, December of 2012. We Know When Mayan Calendar Ends - But Then What? it was about following the flow of creation. The following is from an article by Carl Johan Calleman. He wrote the book "The Mayan Calendar and the Transformation of Consciousness." Although there are clues to the possibility to massive economic change - it is difficult to know just when this might happen. Some dates predicted by some people have already come and gone. Calleman has a system of alternating days and nights that is based on his interpretation of the Mayan calendar. 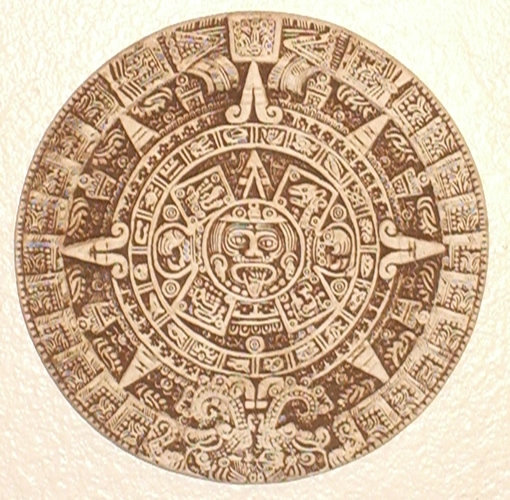 Also, in his model, the Mayan calendar ends in 2011 rather than 2012. At this point I feel it may be in its place to make a jump forward to discuss what is likely to occur after the two pulses of LIGHT in DAY 4 and DAY 5. In the Fifth NIGHT, (November 18 2007 – November 12, 2008, ruled by the energy of Tezcatlipoca, the god of darkness), we will see the last desperate attempts of the West, and power hierarchies based on materialism everywhere, to remain in control and strengthen their power in some new very oppressive way. If the international monetary system collapses in DAY 5 we may for instance come to see this replaced by a centralized electronic control over everyone’s economic interactions (Not to mention control of whereabouts and other things). Except that I simply look upon it as a phase in a cosmic plan, this is the time period when many of the scenarios described by conspiracy theoreticians may come true. Regardless of the concrete forms it may take, this is when everything will be made to keep people in the fold. In the same way as we, during the Fifth NIGHT of the Planetary Underworld (1932-52), saw an alliance between Nazi Germany and the Soviet Union of Stalin we may well in the upcoming Fifth NIGHT come to see an alliance between the rulers of China and the United States – all in the interest of maintaining a hierarchically ruled world with a focus on material gains. And in the same way as the mentioned dictatorships of the Planetary Underworld enjoyed the overwhelming support of their subjects, we may well come to see a strong support by the subjects of the “democracy” of the US and the “popular” regime of China as the Fifth NIGHT begins to rule in the Galactic Underworld. Especially in the United States people are already on a massive scale deluded into thinking that they are free. Those with knowledge of the changing energies of the Mayan calendar will not be as easy to manipulate by fear, since they are aware of the wave movement of history. Creativity is born out of chaos and if you think more deeply about it you realize that there is no linear way from today’s world (2004) to the Enlightened (2011). Instead the enlightened world can only emerge out of a series of trans-formative pulses, including periods of destruction, such as the Fifth NIGHT. The paradox to understand is that the very process that seems to break down the world economy and political dominance is also the one that paves the way for Enlightenment. The emergence of a fully enlightened collective state of consciousness can only thrive in a global consciousness that is balanced. This is because the imbalance that has been dominating humanity for some 5000 years has had its direct cause the dualist frame of consciousness that was ruling throughout this time. I feel however that the kind of Enlightenment humanity will approach as the cosmic plan is completed in 2011 will not be like anything that has existed previously. Although there are many descriptions of enlightened beings and ascended masters from human history I personally think that their states of consciousness in various ways have been limited by the creation fields that were ruling at the particular time they were (or are) living. Only in 2011 will all veils separating human beings from the divine be removed and the supra mental consciousness of the Universal Underworld will be unexplored territory. In a sense we are talking about the emergence of an entirely new species of human beings. For the first time Enlightenment will take place in a balanced global creation field and this certainly will influence the depth and scope of the cosmic consciousness that may be attained. During the Galactic Underworld, each Day and Night lasts 360 days. The 7th Day is the last one before the next Underworld begins in October 2011. According to Johann Calleman the 13th Heaven of the Galactic Underworld begins on November 3rd, 2010 and then also the 1st Heaven of the Universal Underworld on February 11, 2011. In the Mayan pantheon of deity the 12th Heaven is governed by the God of Dawn, Tlahuizcalpantecuhtli . We are, in other words, entering into a Yin cycle of night to await the new dawn as we integrate the lessons of the previous cycles. The mid-point of the 12th Heaven or 6th Night is on May 27, 2010. This is the second Harmonic Convergence and represents the first true experience of a pulse of cosmic consciousness entering our collective soul as a whole versus scattered individuated experiences of it. It is during the 12th Heaven of the Galactic Underworld that a balance between East and West should be attained in some fashion according to Calleman. Everything that has happened since 9/11/01 has been taking us in that direction even if we do not resonate with how it has been approached. The 11:11 gateway follows our entry into the 12th Heaven by three days which is often esoterically considered to be a sacred cycle in and of itself. The three days from the time of Christ's burial to his Resurrection is an example. Also there is a three day window of time at full and new moons wherein the energy of that event is accessible. The 11:11 gateway is about activation of a genetic trigger in our DNA associated with ascension and our galactic memory circuits or Zuvuya. So herein we have circumstances which are excellent for achieving some of the consciousness goals we have been dreaming of for so long. Passage through the 999, followed by entry into the Galactic Underworld's 12th Heaven and activation at a new octave via the 11:11 gateway. After our passage through 999 we are in a new position in consciousness as a collective to be drawn into the womb of deep integration to start a long exhale. As we do, our 11:11 galactic memory circuitry can be activated at the next octave of its matrix. All this ultimately preparing us for the final leg of our journey through the harmonic series of evolution identified by the Mayan Calendar (long count). Keep in mind, that shortly after the start of the 13th Heaven of the Galactic Underworld on November 3rd, 2010, we also enter the 1st Heaven of the Universal Underworld. All 13 Heavens of the Universal Underworld will then unfold concurrent with the completion of the 12th Heaven of the Galactic Underworld and ALL Underworlds will complete on October 28th, 2011. That is 13 Universal Heavens in only 260 days! Its also important to realize that all the other 7 Underworlds that preceded these two are still running concurrent as well in their 13th Heaven modalities and will also complete at the same time when the Mayan Calendar ends on October 28th, 2011. The core message here to me is, take advantage of the integration period being offered here as we enter the 12th Heaven of the Galactic Underworld on November 8th and which runs until November 3rd, 2010. After that, things will be in a profoundly accelerated mode like we cannot imagine just yet. Clarity within our being is what is required to maximize our realization of the potential being offered us here. Clarity about who we are and where we are headed. Not necessarily in specifics, but in essence, yet specifics follow essence. If we do not have clarity it is because we have conflicts going on within us. I have come to realize that all inner conflicts stem from one root conflict having to do with our core sense of self-identity. If we are not truly anchored to who we truly are as a being of Pure Awareness, Love and Spirit, then we wind up trying to find our identity in many other things that are not nearly as expansive. Then, we try our hearts out to get free of what feels like restrictive limitations and for all the effort it never seems to bear much fruit. For every limitation we liberate ourselves from, three more show up. However, if we can find a way to shift our inner sense of self-identity at a fundamental level far below the conscious threshold right within our DNA then we start navigating life with a whole new compass and things can shift and flow fluently very rapidly after this occurs. In order for this deeper self-identity anchor-shift to take place we have to have a direct experience of who we truly are, a means to experience our true identity at will -- which will lead to being there continuously -- and a means to record that direct experience of our true identity within our cellular consciousness and DNA so it becomes an autonomous perceptive modality much more quickly within us. It needs to be rooted right in the very marrow of our bones so to speak so that we intrinsically KNOW who we are and what that true identity FEELS like in our body and our being. Only then will we NEVER forget again! Roland Emmerich is working on a new movie titled 2012, based on a Mayan belief that the world will end in 2012. The movie 2012 has an ensemble cast, including John Cusack, Amanda Peet, Danny Glover, Thandie Newton, Oliver Platt, Chiwetel Ejiofor, and Woody Harrelson. Its releasing 13 November 2009 !!! Judging from the teaser trailer of 2012 it seems to be a new version of The Day After Tomorrow, so nothing really new… But I’m still thrilled by 2012. The prophecy is based on the "precession of the equinoxes" -- a process in which the earth's axis draws a circle across the sky. It takes about 25,765 years years for the earth to complete each cycle. This is called a "Great Year" or "Platonic Year." As a result of this extremely slow wobbling of the earth's axis, the pole star (a.k.a. north star) changes over time: the star Thuban in the constellation Draco was the northern pole star circa 3000 BCE. Polaris is the current pole star, being only about a half degree offset from the north celestial pole. 1,2 If we wait for about 21,000 years, Thuban will again be the pole star. For millennia, most astrologers have divided this circle into twelve parts, each called an "Astrological Age," "Precessional Age," or a "Great Month." Associated with each age is one of the twelve signs of the zodiac. Each sign takes about 2,150 years to traverse. 3 We are currently somewhere near the end of Pisces -- the fish -- and near the start of Aquarius -- the water bearer. Astrologers are an independent lot. The transition from the Age of Pisces to "... the dawning of the age of Aquarius" 4 has been variously estimated as happening on a date between 1447 and 3621 CE. However, many astrologers believe that it has recently happened or will occur in our near future -- perhaps in 2012. Incredibly, the Babylonians, Cherokees, Egyptians, Hopi, Mayans, Sumerians, and Tibetans all were aware of this 26 millennia-long cycle. Each developed calendars based on this Great Year. The calendar developed by the ancient Mayan civilization is receiving a great deal of attention today. Rather than divide the Great Year into twelve sections, they used only five. These were called "World Ages," "Creation cycles," "b'ak'tun cycle," or "Great Cycle of the Long Count." Each lasts about 5,125.36 of our years. Each of the cycles is in turn subdivided into 13 "Baktun." This date represents 1,007,305 days from the start of their calendar. There aren't any levers or forces in the solar system that could produce such a transition. 2012: Michael Drosnin, author of "The Bible Code," found a hidden message in the Pentateuch (the first five books in the Bible). It predicts that a comet will crash into the earth in 2012 and annihilate all life. As a minimum, I suspect that at least one species will survive: cockroaches. They seem immune to all environmental disasters. If evolution is true, then we need not worry too much. As long as some species of life survives, one or more intelligent species will eventually evolve. They will probably have opposable thumbs, large brains, two ears and eyes. But they probably would not look much like present-day humans. 2012: Kev Peacock predicts that the Sun's magnetic field will reverse, and induce a reversal of the Earth's magnetic field. This will cause massive geothermal and tectonic catastrophes. Something will happen to the mythical island of Atlantis which many people believe disappeared beneath the waves many thousands of years ago. Presumably, it will surface. 2012: Vijay Kumar predicts that World War III is most likely to happen around 2012. This will be followed by a permanent state of spiritual elevation. "Beyond 2012 it shall only be harmony and peace all over." It will be called "the golden period." However the transition will result in the deaths of millions of people -- both innocent and those guilty of crimes. Bhagwan Kalki, a spiritual master of the highest order, is predicted to deliver humanity from today's ills. Terence McKenna: He is webmaster of "The Final Illusion" web site. He predicts that on 2012 at "the moment of the [winter] solstice and the heliacal rising of the galactic center, levels of planetary novelty will exponentially increase." The results of this "ultranovel event" are difficult to predict, but may include "Hyperspatial Breakthrough, Planetesimal Impact, Alien Contact, Historical Metamorphosis, Metamorphosis of Natural Law, Solar Explosion, Quasar Ignition at the Galactic Core." Some of these don't sound too healthy for life on earth. 5 I am personally hoping for the latter, because it would take about 50 millennia for any effects of that ignition to impact earth -- long past my life expectancy. Email: A visitor to our web site predicts that three days after the solstice, on DEC-24, one third of the Oort cloud will rain down on the earth. The Oort cloud is a massive collection of comets that encircle the solar system beyond the ex-planet of Pluto. Devastation would be total. It is unclear why such a large part of the Oort cloud would suddenly implode and zero in on the Earth's location. Email: Another visitor suggests that a new cosmic cycle will begin after midnight on DEC-24. The sun will collide with another sun made of antimatter producing a "humungous nuclear explosion" which will turn every living entity -- from humans to microorganisms on Earth to ashes or dust. The 4th dimension will be "thrust upon Earth right after midnight." You might want to make certain that your insurance policies are paid up to date! Email: Ric Steiner wrote: "On December 21st, 2012, the ZODIAC will be in perfect alignment for the first time in some 24,000 years. Those who worship Lucifer and Satan are already anticipating that he will manifest bodily on Planet Earth on or near that day. Even the top guns of those huge radio and television pulpits now have their sticks in the pot. 'Maybe,' they say, 'it just might be coincidental with the Second Coming.' So, in toying with it, they keep it on the back burner or even place it on the top shelf." Most of us are not archaeologists or astronomers, anthropologists or astrologers. Yet the majority of what is written about one of the most exciting and relevant subjects of our day - the approaching Winter Solstice 2012 end-date of the Mayan Calendar - appears in words aimed at specialists and couched in language that can be hard to read. You may be hearing a lot about the Mayans, their calendars, hieroglyphs and mysterious temples scattered throughout the jungles of Mexico, Guatemala, Belize and Honduras. Why is there so much talk about the "end of the Mayan calendar" and what does it mean? Is there something significant we should know about the Winter Solstice date of December 21, 2012? How were the Mayans able to track long periods of time and why would they want to? Why should we care about the Mayans today? Is there anything we can learn from them? I'll begin by sharing how my own interest in the subject developed and go on from there. What is the Mayan Calendar 2012 connection? In conversations I’ve had with Maya descendants living in Guatemala we often spoke of the Mayan Calendar and the year 2012. First off I will tell you much of what was discussed revolves around a time period, not a specific date. The time period is the 6 month period between the Spring and Fall equinoxes. After that period comes the Winter Solstice on December 21 2012. The Maya had numerous calendars with which they tracked the movements of the planets (Venus, Mars, Saturn and Jupiter) and the rotation of the Earth around the Sun. Two of these Mayan calendars are those which draw our attention to 12/21/2012. Another interesting cycle is the precession of the equinoxes lasting approximately 26,000 years. The long count of 5,125 years is 1/5 of that cycle. December 21, 2012 marks the end of the Long Count and Precession Cycle. A fascinating astronomical occurrence will take place that day. The sun will be seen in a conjunction with the crossing point of the galactic equator and the ecliptic which is referred by the Mayans as the Sacred Tree. Since this is due to take place on the winter solstice, this should provide clear evidence that the proper end day of the Mayan calendar is December 21, 2012. Some say December 22,nd, 23rd or even other dates. However, the solstice was an important day to the Mayans and it is logical to think that they would conclude their calendar cycle on this day, coupled with the fact of the rare astronomical occurrence set to take place that day. Overall, the Mayan calendar system is amazing and complex. It is the most accurate calendar system ever invented by anyone. The complexities go far beyond my capabilities to explain so I have listed links below to serve as excellent resources of information. The Maya Tzolkin Calendar and the Maya Long Count Calendar both contain references many today believe point to the year 2012. The sacred Tzolkin calendar represents a 260 day period that uses 20 days rotating in conjunction with 13 tones which create the foundation of the calendar. The day 4 Ahua (aka: Ajaw - the day name can vary depending on which Mayan dialect is used) is a special day as it is always on this day during which the Baktun periods begin (the 5,124 year periods). Baktun periods however are represented in the Long Count Calendar. Baktuns are the fifth placemark in the Long Count and the upcoming date in 2012 marks the movement from 12 to 13 (13.0.0.0.0). Tortuguero is a Maya ruin site in southern Mexico that contains a stone carving (Monument 6) with the Dec. 21, 2012 date represented in the Tzolkin calendar. The carving references 4 Ahua (the beginning date within the Tzolkin and Long Count calendars) and the remaining visible glyphs are interpreted as referecing an event occuring on the beginning date upon which the diety will descend. Will It Be The End Of Times? Just what does December 21, 2012 mean to us? Is the end date of the Mayan calendar really the start of an approaching apocalypse, or even a spiritual rebirth? How much of what we're hearing is science and how much is superstition? This blog provides a balanced look at the 2012 phenomenon with leading researchers, writers and scientists in the field explaining exactly what this date means, why it's important, and what we should expect. Copyright 2009 - Know All About December 2012 ! !